On the Monday morning three days after Japan’s March 11, 2011 triple disaster of the 9.0 earthquake and resulting tsunami, topping 45-feet, which, in turn, disabled the Fukushima nuclear plant, my friend Judy’s mom, Delores Coomes, died. The following weekend, we made the trip to Elgin, Illinois to pay our respects. On the way back to Michigan, we chose to drive Chicago’s Lakeshore Drive from just south of Lincoln Park, past Navy Pier to Millennium Park. If we’d had the time and inclination, we could have made a week of sightseeing in this small portion of the twenty-six-mile stretch of Lake Michigan shoreline, beginning at the Lincoln Park Zoo, taking in the Children’s Museum, the Art Institute of Chicago, the Sears Tower, Adler Planetarium, the Field Museum of Natural History, and Shedd Aquarium, all interspersed with green space, park after park, along the Lake. 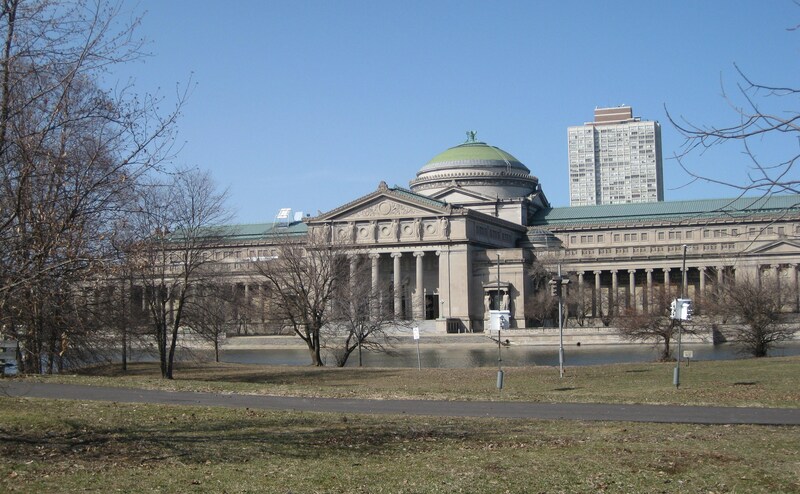 We could have admired a number of medical centers and visited the Douglas Tomb State Historical Site, and even driven through President Obama’s former Hyde Park neighborhood before we arrived at the Museum of Science and Industry. But it was the first beautiful weekend day of 2011, the last official day of winter, and after our morning of tears during a generous Lutheran funeral service and the following hour when Judy and all of her four siblings and both daughters had shared remembrances of their mother and grandmother, we were not in a sightseeing mood, so we drove until we arrived at the 2000 block of Lakeshore Drive, at the northern end of Jackson Park, where I had read there was an island (the actual address for Wooded Island is: 6401 S. Stony Island Ave.), and then turned west on Service Drive, heading around the back of the Museum of Science and Industry. Wooded Island is just south of the Museum of Science and Industry in Chicago. From days gone by . . . Wooded Island has not always been an island. 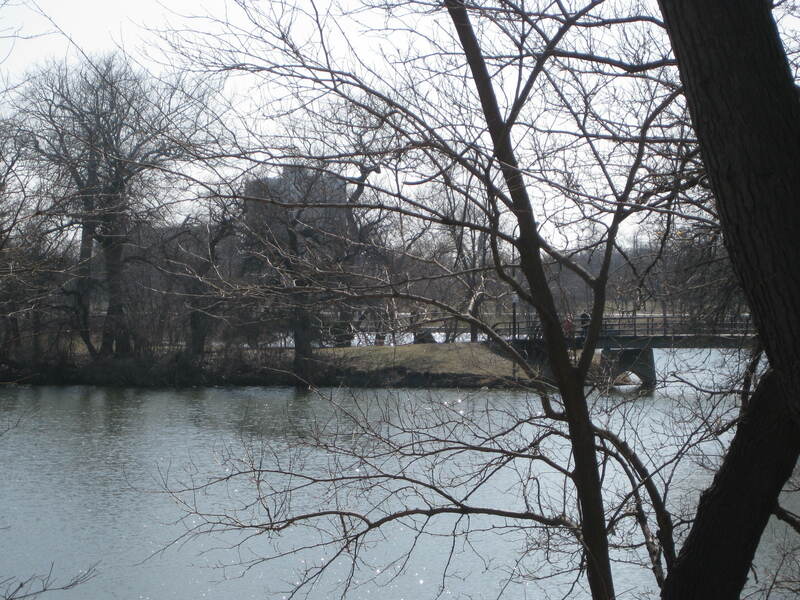 Before it was an island–until 1867–it was the tip of a peninsula, jutting into the Jackson Park Lagoon, which was connected to Lake Michigan. Jackson Park, named after President Andrew Jackson, was created by Frederick Law Olmsted, who created New York’s Central Park and Detroit’s Belle Isle Park. In 1890, when Chicago won the competition to hold the World Columbian Exposition, Olmsted and Daniel Burnham were commissioned to create the fairgrounds. In fulfilling that goal, part of Olmsted’s vision was to create a sanctuary of nature, a respite from the bustle of the Exposition. A crew of workmen severed the peninsula from the mainland by dredging the Lagoon and using the fill to add to the new manmade sixteen-acre island. Today, Wooded Island includes the Paul Douglas Nature Sanctuary, serving as a bird and butterfly sanctuary. Only one feature of the island remains from the original plan, the Japanese garden, which has been known as Osaka Garden and the Garden of the Phoenix. The original plan also included the Phoenix Pavilion, which was accompanied the Japanese garden was to accompany. Both were gifts from the Japanese for the Columbian Exposition. Olmsted opposed including the Pavilion, fearing it would create a bit of a “bustle” of its own and take away from the reprieve the island was to offer from the Exposition, but Burnham won out and it was included in the plans. The garden is here today only because of a restoration project to return the garden to its pre-World War II state after vandalism prompted by anti-Japanese sentiment during the war destroyed both the Phoenix Pavilion and the Japanese garden. In the last month, the Chicago Tribune has featured a brief history of the Japanese connections to the island; Yoko Ono’s Sky Landing sculpture is set to be unveiled this fall (2016) at the site of the original Phoenix Pavilion. … to a steep moon bridge curving up (visible behind the budding March trees) and large boulders punctuating a pond, creating a waterfall. A perimeter asphalt path around the islands invites runners, bicyclists, strollers, and birdwatchers (dogs are not allowed on this path as they disrupt the birds). Two hundred and fifty species of birds have been observed on this island, which provides a resting place for birds migrating and otherwise. The day proved an excellent one for sighting the year’s first robin and discovering a patch of snowdrops blooming beneath a bare-branch sapling, the call of a woodpecker above the dried husks of last year’s milkweed pods. Native plantings abound: Elderberry bushes, Sargent Crabapple, Swamp Rose, Burr Oak, Mapleleaf Viburnum. And waterbirds: gulls, pairs of mallard ducks and Canada geese, cormorants. 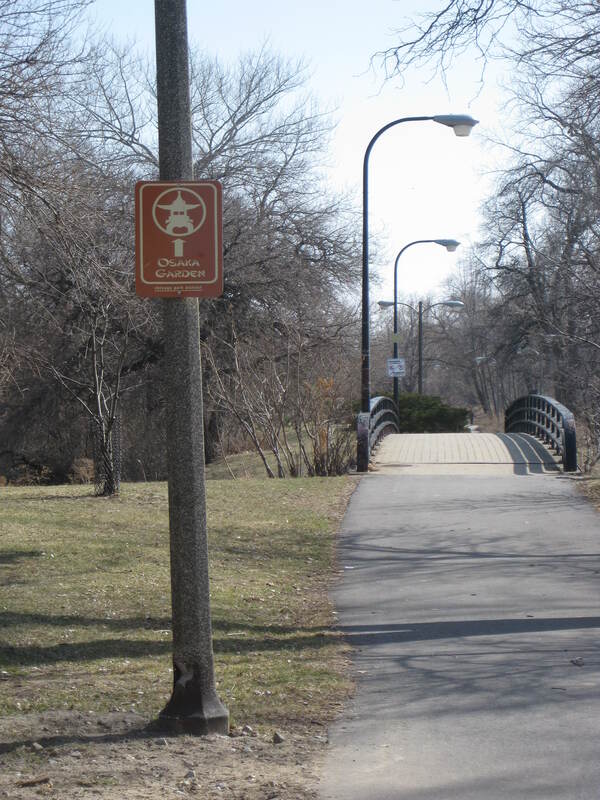 At the south end of the island, another bridge connects the island to the rest of Jackson Park. A fitting end to this day. An old Burr Oak, now physically absent from the landscape, lovingly remembered. And a younger Burr Oak taking root in its place, preserving the memory of its forebearer’s place on the earth for all those who have known them both. Wow Maureen – once again – thank you! and I am touched…. I remember how beautiful the weather was that day – it was striking. Of course, we all said that Mom had arranged it and about 12 of us took a long walk along a prairie path after the lunch was over. The photos from that walk are so precious to me. I hadn’t realized (or forgot) that that was the day you discovered Wooded Island. Another “once again” – I’ve been there! I’ll tell you about it when I see you. Funny thing – somehow, I had forgotten that my mom died on the day of that earthquake. Another funny thing, Norman Wachler died–or was buried–on the day Katrina struck New Orleans. I guess our parents chose to go out with a bit of fanfare. I’m just seeing your response over a year later, Judy. The oddest thing is that this blog post “posted itself,” a story I will share with you we meet: a story swap!